Manufacturers who use wood coatings have more and more options available to them when it comes to their finishing lines, and the best choice for their business isn’t always clear. Letting just one or two factors determine the direction you go can be hasty, a lesson that rings true when decision makers are considering whether to use a conversion varnish or a polyurethane. To help us take a closer look at the advantages and disadvantages of each coating type, the team at Accessa Coatings Solutions and other experts in the coatings field help us better understand when each type makes sense and the differences between conversion varnish and polyurethane. Chad Everett at Accessa Coatings Solutions works with conversion varnishes on a daily basis as Coatings Consultant for customer Middlebury Hardwood Products, where about 85 percent of all clear topcoats used are conversion finishes. Located in Middlebury, IN, MHP is a leader in the manufacture and distribution of cabinet doors. For more than 25 years, the company has been supplying hardwood cabinet doors to the manufactured housing and recreational vehicle industries. 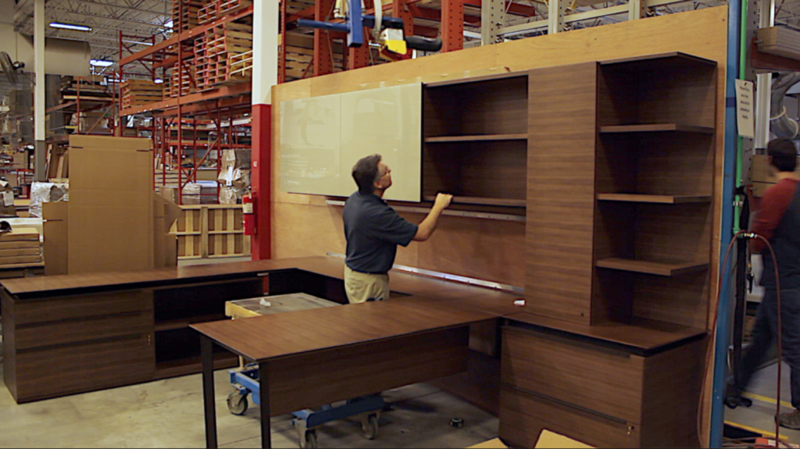 Conversion varnish helps MHP’s­­­­­ finishers create a custom-cabinet look and meet the Kitchen Cabinet Manufacturers Association’s performance standards. These same qualities are often sought out for the residential furniture market, where conversion varnishes are commonplace. One of the biggest advantages of a conversion varnish for MHP, Everett says, is that it dries quickly so a product such as cabinet doors can be finished and stacked fast, making it possible to ramp up production when demand is high. Conversion varnish also has good mechanical strength, a long pot life and high percentage of solids. “Secondly, it provides a durable finish that helps to provide Middlebury Hardwood Products with a good product for their customer,” Everett says. But conversion varnish isn’t the right finish for every job. Performance and price must be carefully regarded. “The customer needs to have an expectation as to how the coating should perform and what look they want to achieve. They also need to weigh the value of the quality of the product compared to the price. Many times the lowest price is not the best value,” he says. When customers evaluate how well a coating will work with their current system, if significant changes would be necessary to make a change, is it worth the cost? From a performance standpoint, you have to determine how the product sprays, dries and lasts, among other things. Conversion varnishes come up short in some areas. When comparing its product to conversion finishes, a leading manufacturer of polyurethane coatings reports the disadvantages of conversion varnishes include limited build possibilities; limited chemical resistance; UV instability; existence of difficult, sensitive catalyst ratios; poor re-coat windows; difficultly in touch-ups; an inability to achieve a wet look, high gloss or vivid colors; and formaldehyde content. While conversion varnishes are used extensively in the United States, it’s a no-no in European countries due to its formaldehyde content. In order for the resins in a conversion varnish to cure and harden, acid must be introduced. This process produces a byproduct of formaldehyde, and fumes associated with formaldehyde will continue to off gas up to 28 days, until the coating is completely cured. All is not lost however, formaldehyde-free conversion varnishes have recently been introduced into the marketplace, such as AcromaPro’s Bernyl FF line. Les Yoder, Corporate Production Manager at Accessa Coatings Solutions, says about 80% of the products Accessa customers manufacture are put into service within about 10 days of being finished. Though the conversion varnish’s cure isn’t complete within 10 days, it is relatively hard and suitable for use at this point. Accessa Coatings Solutions works with a wide range of clients. They say polyurethane coatings are often the best choice for use in more industrial and commercial settings such as restaurants, offices and airplanes, where there is more wear and tear compared to residential use. Accessa customer Nucraft uses polyurethane on all of its office furniture that calls for a clear topcoat. Since its founding in 1944, the Comstock Park, MI, company has built furniture for conference rooms, private offices, reception areas and training spaces. With clients in Europe and elsewhere around the world, Nucraft has to make sure its tables, desks and chairs meet more stringent environmental standards and BIFMA’s performance requirements. Polyurethane can also produce a look conversion varnishes can’t, partly due to how well it can be built. That glossy, glass-like finish you often see on some polyurethane coated products is many times achieved by applying multiple coats and then buffing and polishing. Conversion varnishes are typically only sprayed to a total of 4-5 mils dry film, while polyurethane can be built up to 10-12 mils dry film in some cases. This thicker layer also increases the durability of the coating. With grainy woods, you can more completely get into and seal pores. Because restaurant tables, hospital furniture and office desks are susceptible to frequent cleanings with strong chemicals and soaps, a longer-lasting finish is attractive to many customers, with a growing market crossover from the residential side. “With polys, we are seeing more demand for homeowners’ outdoor kitchens to protect cabinetry from wind and weather,” Yoder says. A leading manufacturer of polyurethane coatings with whom Accessa represents, Industria Chimica Adriatica (ICA), says the finish’s attributes include having very good mechanical and chemical strength, good clarity, a relatively quick dry time, easy catalyst ratios, versatility (full fill, open pore, etc. ), very high solids and good UV resistance. On the downside, polyurethanes can be difficult to touch up, is generally more expensive and more difficult to use compared to conversion varnish. Its pot life of 3-5 hours means that after the hardener and product are mixed, your production line must be prepared to spray. Conversion’s pot life of 8-12 hours is more forgiving, but Yoder says that shouldn’t deter someone who wants to move to polyurethane. Investing in a metered, dual-component spray gun that mixes the finish right before it’s sprayed is a consideration, depending on usage volumes and throughput needs. Before purchasers start wringing their hands at a possible cost increase or feeling a rush of hope that a less expensive option is out there, Yoder says manufacturers should carefully weigh the pros and cons and ask themselves one question: “First and foremost, you have to consider your application. What are you putting it on and where is that finished product going?” Answering this question may open the door to a new market, increased sales or improved marketability of your product. Should you consider a change in coating type? Contact Accessa Coatings Solutions to start a conversation about your needs.